A curious child, Clayton didn’t resist the bite, he asked for it. But surviving alone is impossible, until Jeremy teaches human-wolf balance, gives him a home, and welcomes him to the Pack - hierarchical founding family where bloodlines are all, and members face deadly challenges. Malcom's tale "Infusion," Clayton narrates "Savage" and "Ascension", and Jeremy tells "Kitsunegari"
Kelley Armstrong has a large number of anthologies for her long-running Otherworld series. 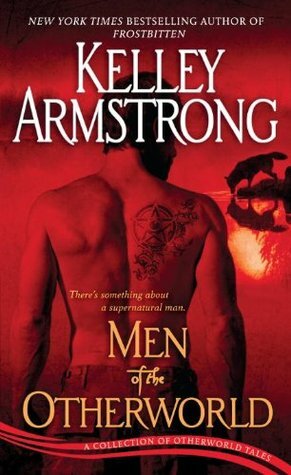 This opened the side stories, but instead of being about different men of the Otherworld like the title suggests, it is exclusively about the werewolf pack, and unlike other short story collections, the points of view do not alter much. If you're a Clay or Jeremy fan, you'll find this fascinating. That's the point. It's a lot of background material on why they both are who they are and how they are. Want to see for yourself the stories Jeremy later tells Elena in Stolen about the troubles of raising Clay? Right here in full color (funny) detail. While there are some funny scenes, it's mainly a dark, serious book. After Jeremy comes into the world, Clay is shown very young and bitten to open his stories. Following that we see his progression, how he is discovered, the ample patience Jeremy employs to win his trust, their slow trail to Stonehaven, the incredible bond between the two, Clay aging and experiencing life, and finally the battles of ascension and alpha wars. The only story besides the opener that isn't led by Clay is the final story, Kitsunegari, where Jeremy finds out a new clue about his past. It is the only one set in 'current times.' Jaime and he are together and have been awhile, so it was interesting to finally see in his head what he thinks of her and the relationship. I loved the couple over the series and wish the author had given the bonding more credit. It makes sense to end the anthology this way because we're making a circle back to the beginning again. This isn't just Clay's book - it's for Clay AND Jeremy. I found out more about Jeremy and deeper into his psyche. I get Clay a bit more. Above that, Malcolm as the big bogeymen is brought further into light. We see we owe a lot of Jeremy's grandfather, who has a short stint. The two characters in Frost are introduced here as young father and son before they hide tail and run for the hills. Some of the animosity with future rival pack members begins here when the boys are young. Much is explained that clears a few mysteries up. If you're a fan of the series, this is an absolute must-have.